If the last “TPG reviews TPG” post had a puzzle (usually platformer) theme, today’s seem to have a spooky theme, both for me and for my computer, as two of these games are pretty graphically intense, in more ways than one. 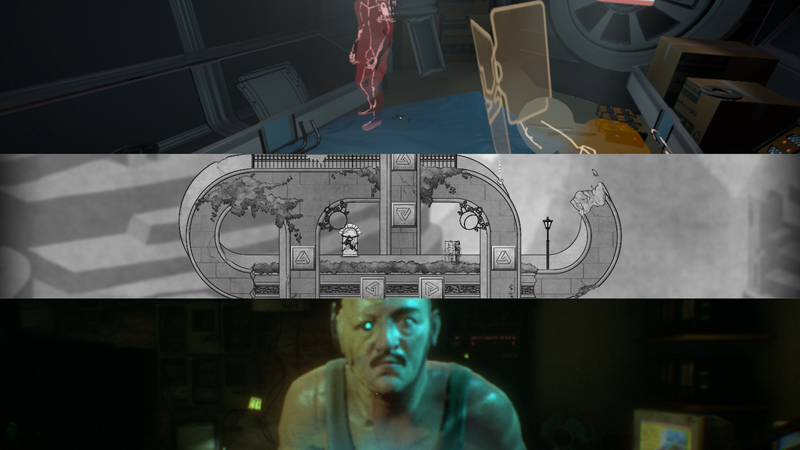 Observer (technically titled <observer_, but that’s dumb) is a spooky stealth game, Tacoma is an exploration (side note: I had no idea this was the game’s genre, but I’m all for it!) game through an empty space station, and The Bridge, a puzzle game that seems to manipulate environments in some way. Only one is reportedly spooky, but I don’t trust the other two. Twitch Prime (a part of Amazon Prime) is giving away 21 free games to subscribers, so I decided to check them all out for just one hour each and give my early impressions in exactly 200 words. You can check out my reviews for Pillars of Eternity, Q.U.B.E. 2, Battle Chef Brigade, Metal Slug 3,Twinkle Star Sprites, The Last Blade, Manual Samuel, GoNNER, Next Up Hero, Uurnog Unlimited, Hue, and Deponia Doomsday in the included links. Not that I’m complaining, mind you, but this game wasn’t all that scary in the first hour. It’s set in 2084, where after a war left the entire world in shambles, a tech company rose to essentially govern all of it. You play as Daniel Lazarski, a Polish detective “observer” who can hack the minds of citizens. The world is clearly “inspired” by (or more cynically, derivative of) dystopian novels such as 1984 where everyone escapes to their drugs and holograms, ignorant of the horrible conditions they’re living under. A brooding soundtrack, dark lighting, and Daniel’s gravelly voice create a “dark” tone, although it often feels too heavy-handed. What I played comprised of scanning objects and talking to people, with only one light puzzle in which I had to input a code. Because I had the game on the lowest settings, it was hard to see things clearly, and thus I completely missed the cue for that code and wasted a considerable amount of time. The dialogue (or often monologues) help alleviate some of the tension, as each character does have personality with even a bit of dark humor. But there’s still a lot I don’t know at this point. Observer is available for free through Twitch Prime until July 17th. Everything that Observer falters in, Tacoma delivers in spades. After the mysterious disappearance of the crew of a space station, your character is charged with recovering information on what happened to them. While it’s clear that bad things are happening, it takes a far more optimistic tone on the future, showing how people are still able to live healthy lives. Near the beginning, you place a book-like device into a panel to retrieve information, and you see the percentage crawl up by 0.1% every few seconds. While waiting, you’re encouraged to explore all of the different parts of the station, peeking into the lives these people led. At one point everything will certainly go to crap, but until then, it’s fascinating to be immersed in the day-to-day struggles of people who live amongst the stars. Each area has one track with audio and holograms depicting the vague outline of the crew’s inhabitants, so you can listen to the same track five different times from different perspectives between characters, as well as go through their personal files. The stylized graphics help keep everything running smoothly, but also create a colorful environment, along with the serene music you hear in museums. Tacoma is available for free through Twitch Prime until July 18th. Looking at an M. C. Escher illustration is freaky, but being in one is an entirely different matter. With a very minimal story that might very well be a stylized biography of Escher himself, you play in hand-drawn illustrations that are extremely evocative of that style, complete with grids, a black and white color scheme, and impossible environments, with a light soundtrack suitable for contemplation. And this game requires a lot of contemplation. There’s a simple set of rules, but they combine with their devious environments to make something incredibly difficult. Much like a puzzle box or a Perplexus, your goal is to get to a door, occasionally picking up one or more keys on the way, and avoiding the “menaces,” giant orbs that kill you in a single hit, although you can turn back time at any moment to try anything over again. Your character can slowly move left and right, but more important is the way you can turn the entire stage. The game does some really creative, tricky, and sometimes nausea-inducing stuff with this, and while it can quickly become baffling, the solutions are almost always elegant. This game blew my mind with how you navigate space. The Bridge is available for free through Twitch Prime until July 26th.